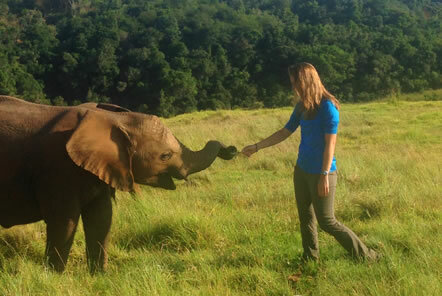 Shannon shares her experiences of volunteering for 4 weeks at the Elephant Care and Research project in South Africa. Thank you so much to Shannon for sharing her fantastic blog with us! "The world is only as good as you expect it to be. Expectations are our minds ruler leveling out the outcome of any given situation. In this growing age, I have learned to expect less. Honestly, I expected to have an awesome career, be out of the house, and on my way to graduate school. Guess what…? I am tucked away behind a desk to come home to my bedroom which has yet to change from childhood given the large Tweety Bird hamper hanging off the door. Our generation has given a new meaning to life by actually taking the time out to explore where we belong in pursuit of true happiness. So following this perspective, what am I going to do? 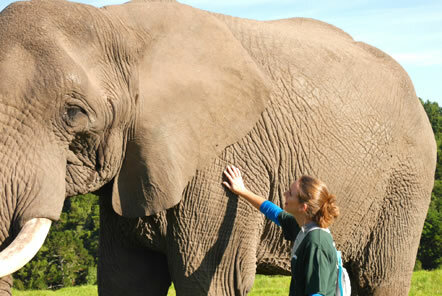 Why not go to South Africa to volunteer at an elephant park for a month. 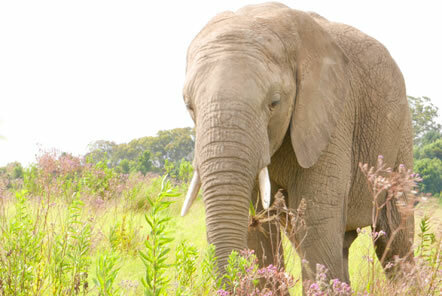 I will be traveling to the Elephant Care and Research project right outside of Plettenberg Bay as a research volunteer studying the welfare of free roaming trained elephants for four weeks. The park was founded in 1994 and is the first of its kind in studying the welfare of captive free roaming elephants. The purpose of this is to ensure the welfare of all captive elephants by observing their behavior and comparing it as stereotypical versus natural behaviors. Most of the elephants here are rescued as baby orphans, circuses, etc. Throughout this trip, I hope to - not expect to - grow as a person, and learn more about the possibilities of life given I am ½ way around the world. I have put myself in a new place with new possibilities and I am anxious to experience and explore this magnificent country. What a magnificent first week it has been! I will admit it has been a challenge from meeting all of the volunteers, the staff, and the of course the elephants - but everything is still magnificent. There are two herds at the park plus the loner bulls. The first herd is Sally’s herd- the main herd of the park. This includes Sally, Thato, Keisha, Nandi, Thandi, and the two boys, Mashudu and Shungu. Everyone has distinguishing characteristics to help tell them apart but in the beginning it is rather difficult. The second herd is Harry’s herd. Harry is the biggest elephant here and still growing! Sally’s herd includes five babies one of which is only two years old. On Friday morning we had a presentation given by Dr. Debbie who is the research director. She explained to us the reasoning behind the research. The objective is to learn about the overall welfare of the elephants in compassion to captive elephants enabling us to learn more about how the elephant acts in the wild. The four components of an elephants welfare are its freedom, its friends and family, the physiological characteristics, and then husbandry. The main principals of the research observe the choices the elephants make, the elephants they spend the most time with, their diet, and any stereotypical behavior- being behavior that usually is not found in the wild. We perform three different tasks to complete the research variables. One is herd activity, the second is nearest neighbor, and the third is Boma Observations. Herd activity is simply what everyone in the herd is doing every 5 minutes- usually they are grazing. The second type of research involved recording who is closest to who every 5 minutes. 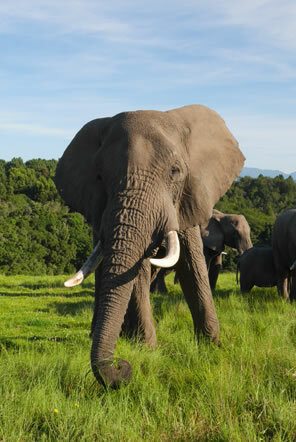 The third is to observe the elephants when they are in the Boma. This includes Shaka and Clyde too- the bulls not part of an established herd. There are additional research studies completed that are done by volunteers here for a longer period of time. One of which is elephant activity. This is done every two minutes and focuses on one particular elephant, documenting what they are doing and who they spend the most time with. Activity budget is the most intense of the field studies which requires documented observations every one minute. Analysis of dung samples is also conducted but that is mostly done by Dr. Debbie - we just collect it. We have a new schedule everyday which can be a bit confusing at times. We start at 6:30am and end around 5:30pm. In the morning everyone usually has a sleep in/Harry’s walk or they are assigned Orchard Browsing. Orchard Browsing involves feeding Harry’s herd and then setting out new branches and collecting the old ones- this activity is the most labor intensive as what they call branches are really more like trees! The majority of the week involves going out in the field and observing the elephant’s behavior recording what I explained above. 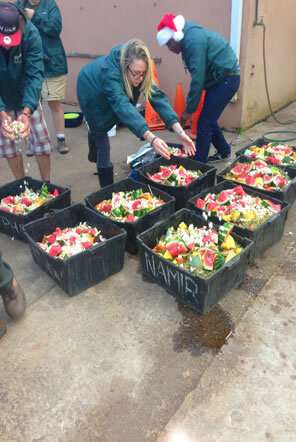 We also help with preparing fruit buckets by cutting the fruit (potatoes, carrots, beetroot, pumpkin and apples with a machete) and then placing them in baskets for the tourist. One of my favorite activities is dung paper. The park collects dung to recycle it and make it into paper which is then sold in the gift shop. First you boil down the dung. Then it is mixed with shredded recycled paper along with some water. Once blended, it is spread out into sheets and left to dry in the sun. Once is it dry we paint it. We stamp bookmarks, or make small notebooks or paint a picture if we are good. All of this is then sold in the shop. This job is very fun, relaxing and almost therapeutic. My guide’s name was Farwell. He is from Victoria Falls which is in Zimbabwe. It seems as though a good amount of the guides are from Zimbabwe. He resided in the Shana tribe. I asked him how to say thank you in Shana which is stated was Nitendo. All of the volunteers are wonderful. My roommates name is Vivian and she is from Germany and is 18. She has been here for 10 weeks but this week is her last week here. She is then going to venture up into Cape Town to explore. The new volunteers are Mary, Sharon, Natalia, Mark, Kelly, Warren, and Lisa. Mary is from Chicago and Natalia is from Columbia. All of the rest are from the UK. All of the old volunteers are German; believe it or not. Apparently they do not get a lot of Germans but this time they got them all at once. They are Linia and Davina and Andra. There is one other old volunteer named Misha from the UK. Misha is super helpful and is truly a caring person. The two interns are Lisa and Jesse. Then there is Jay - who is the volunteer coordinator and Mpho who is the volunteer coordinator assistant. This weekend we are going to Monkeyland and Birds of Eden. There have been very good things said about it so I am really looking forward to it. Until next time! What a fun filled weekend! It was constant and nonstop but that is exactly what I expected on this trip. On Saturday we woke up around 7:00 am to go the Sedgefeild Market. The Sedgefeild Market had been recommended to us by other volunteers. It is a huge market with tons of food, souvenirs and quint shops. It was a bit far so we left around 8 to arrive about 9. Originally we were planning on staying until about 12 because that is when we were told it was closed. We most certainly made the most of our time there and surprisingly spent all of our money! Oopsy! That evening we went out to Flashbacks- the bar in Plettenberg Bay. It was Natalie’s last weekend so it was nice to spend time with her. On Sunday, we started off the day at 7:15 to travel to the Plettenberg Game Reserve to go on a safari. The weather is super unpredictable here so it rained the first hour and was super cold. Of course I wore shorts, a tank top, and a rain jacket and the temperature did not reach above 50 degrees. On another note, as soon as I sat down in the truck, I turned my camera on and it was broken! The screen was all of these colorful lines. I was very upset but did not let that ruin my time. Luckily I had my Iphone and managed to capture good photos and videos. The overall safari was one of the coolest things I have ever done. I kept thinking in my head “Shannon, you are in South Africa on a safari.” It has just always been a dream and now I can finally say I have done it. We saw a wide variety of deer along with a giraffe, a herd of buffalo, two cheetahs, some ostriches, and two lions. 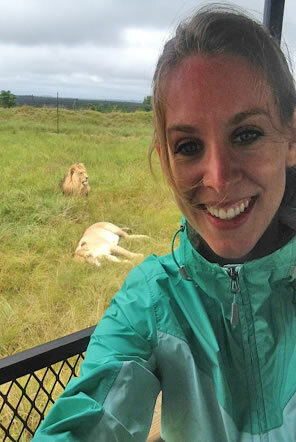 We were able to get super close to almost every animal and it was absolutely spectacular! After the safari we went back to the park to change because it was super cold and we wanted to go to Enrico’s. We had heard very good things about this restaurant so figured we would make it a point to go. We finally got seated and the view was amazing! It looked out over the coast of the Indian Ocean. I could not stop looking at it. I felt an instant release of relaxation. It was awesome! To be honest, the food was very average. We got back to the park around 3:30. The last thing on our list for the weekend was to hike the Rooberig Nature Park hike. Andreas- another volunteer from Germany- said it was a really good hike and the views are out of this world. Lisa and I decided to go while Sharon stayed behind. I will say the hike was one of the best hike’s I have ever been on. It overlooked the entire coastline. Higher up there was a plot of seals at the bottom. Apparently some people have seen great white sharks where the seals were. We waited at the top for a while hoping we would see one but we never did. In all, this weekend was spectacular as every weekend has been. In my mind, I was hoping every weekend would be jam packed with activities and opportunities to experience what South Africa has to offer and this weekend did just that. Who can say they spent Christmas in South Africa?! I can! Every year the park purchases some type of gift for the elephants which the volunteers prepare and present to the elephants. This year it was 37 watermelons! One of the elephants’ favorite foods. For about a week everyone brain stormed to figure out what we could do with 37 watermelons. The conclusion- make snowman and Rudolphs! 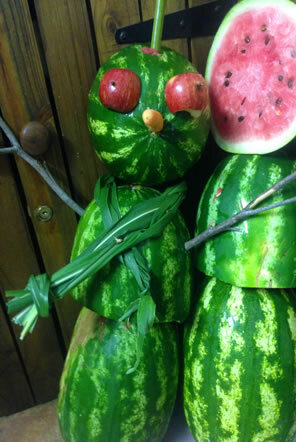 We created the snowman using 2 watermelons each, a bamboo stick, apples, carrots, and bono grass. On Thursday evening we gave Shaka and Clyde their snowman and they loved it! Christmas morning we woke up and presented Harry’s herd with their presents. They adored them. Tambi, the youngest of the heard did not know what to do with her watermelon and it was a sight to see. We all were able to choose which elephant we wanted to gift. I choose Keisha. She is my favorite elephant here. She is the sweetest, the smartest, and absolutely beautiful. 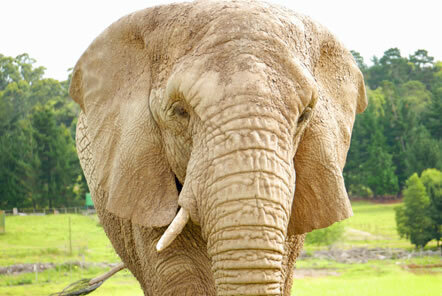 She has very jagged ears because she was abused and bullied by other elephants. She was being transported when she was a baby to a game reserve when her mother passed away during the transport. She attempted to join another herd and suckle on other females but she was rejected. Keisha accepted her gift with much appreciation and was very joyful when she ate it. After we fed the elephants their presents we were off to the beach. We got the beach around 11 a.m. At first it was over cast and pretty cold. Luckily it cleared up and it turned out to be a very nice day! The beach itself was very pretty. It was not too crowed where we were located and had a great view of Rooberig Nature Park. That night we went out to dinner for a Christmas meal. Zoe had recommended a place called Lemon Grass in Plettenberg Bay. The restaurant was super nice! We started off with cocktails. Christmas day here was far from traditional but it was very enjoyable in the end. Let's Go To Cape Town! Throughout the days at the park, it was clear to me that you simply could not visit South Africa without visiting Cape Town. The previous volunteers, the research staff, the guides, and even the visitors of the park all raved about Cape Town and highly suggested I make a point to visit. So… I did! The three amigos, Lisa, Sharon, and myself, started planning the trip super last minute. I will admit it was difficult to bring together, especially considering we were going over New Year’s Eve, but it all came together. We all had the things we wanted to do the most. Sharon’s top choice was Robbins’s Island, Lisa was ecstatic about the markets and my bucket list included Table Mountain and Lion’s head. A few days before we left I insisted on making an itinerary to ensure everyone saw and experienced what they wanted. 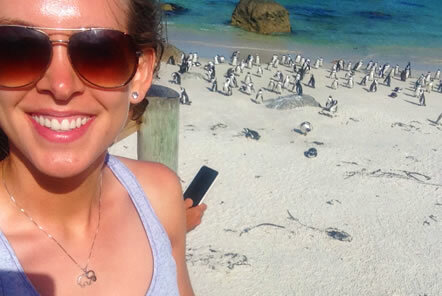 I am not sure how we did it but we managed to squeeze everything Cape Town had to offer in 3 and a half days! I was super amazed! There were some bumps along the way-as traveling goes- but I am super pleased with the trip! The next day we slept in a little bit and headed down to the V&A Waterfront. The Waterfront is a super cool place with tons of shops, tourist activities and a mall. The first thing we did was attempt to purchases tickets for Robbins’s Island. To our surprise, tickets were sold out until January 11! We tried to book online about 2 weeks in advanced but they were sold out then too. It did not occur to us that New Year’s is one of the busiest times for Cape Town. This upset Sharon a great deal but this would not be our only attempt. We continued to explore the waterfront and decided to purchase some tourist attractions. We purchased two boat tours. One was a power boat tour of the Cape coastline and the other was a party boat tour on New Year’s Eve. The power boat tour was cool. We were hoping to see whales (apparently the tour before us did) but unfortunately, the whales did not want to say hi. After that we headed back to the apartment to get ready for our New Year’s dinner. New Year's Eve was…. interesting. So… the party boat was not all it was cracked up to be. Three types of beer (Lisa does not like beer), a grocery store platter of veggies and wings, no tables, no kitchenware, five pocket shots, a mediocre DJ, a 50 year old bachelor herd stuck on the coast of the rocking (alcohol and boats do not mix well) Southern Sea until 2:00 a.m. Oh so help me. I actually decided to talk to the captain and request we head to shore earlier than scheduled. Everyone on the boat just looked miserable. The plus side to the boat however was the conversation with the Captain. The Captain of the boat told us that catamaran was usually used to taxi tourists to and from Robbins Island. I explained to him how we have been trying to get tickets but have found ourselves unsuccessful. He suggested to arrive at the ticket counter at 7:30 am on Saturday. That we did and guess what? We got tickets for 11:00 am!! Robbins’s Island was incredible!! We started off with a walking tour of the prison by an ex prisoner. How cool?! A guest asked what his crime was and he murder two white men and was charged with terrorism. Wow. We got to see Nelson Mandela’s cell and all of the grounds. The only downfall was the group was extremely large so it was hard to hear the guide at times. The next part was the bus tour. The bus tour is a 45 minute tour of the entire island showing everything from the limestone cave, the church, the power plant, and the school. Originally we were on a super crowded bus. Luckily, we were given a second chance to see Nelson’s cell- we did not really see it the first time around given the amount of people. This was great because not only did we see his cell, we also got on a bus of maybe 15 people- way more comfortable. Lisa and I planned on hiking Lion’s Head. I must say, Lion’s Head was my favorite part of Cape Town. As I reflect upon it and realize what I did, I feel proud and accomplished. I am fulfilled that I climbed the mountain adjacent to one of the seven wonders of the world. It would it be cool if I could say I climbed one OF the seven wonders?- yeah sure but for today I hiked the mountain next to it. It was one of the most difficult hikes I have ever done. At one point we had to climb latters and literally rock climb up the mountain. If someone were to fall, they would be a goner. I mean it was scary. We went around 6:00 p.m. and it was the most perfect time to go. The sun was setting so it was not too hot and it made for a specular view! Also there were plenty of people to help out if need be on the tricky parts of the hike. It was outstanding on the top. All of Cape Town was in sight including Table Mountain. I sat on a rock and took it all in for about 15 minutes. The hike down I would say was even harder than the hike up. Our legs were super shaky and we were running low on energy. Also going down is more pressure on the knees (oh gosh I sound old complaining about my knees). The day before (sorry, going a bit out of order) we conquered Table Mountain which was super cool. One of the seven wonders! At first we were all pretty nervous. Approximately 65 people jam into a cable car hovering above thousands of feet rapidly moving up a mountain by a string- and get this- the floor of the cable car rotated! I understand, it is only fair to give everyone a view of all angles as it travels up the mountain- but man was it an uneasy feeling! Good thing it was only four minutes but it felt like 20 minutes. At the top there was a restaurant and a gift shop. We walked around the top where we found signs explaining the flora and fauna of the mountain and what makes it the one of the wonders. We were very lucky it was such a clear day because we were able to get great views! Our last night in Cape Town we decided to go to dinner at one of the most popular restaurants in Cape. After dinner we decided to hit the town since we have yet to experience the club scene at Cape. We decided to go to Shimmy Beach. 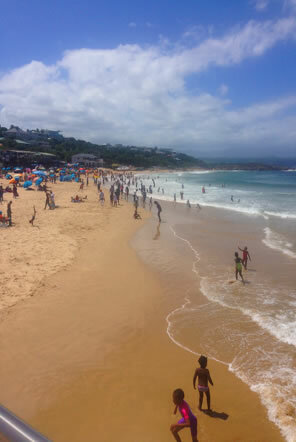 Shimmy beach is kind of like a Secrets in Ocean City, Maryland but in South Africa. There was an inside and outside portion. The outside had a swimming pool in the middle of the dance floor and the DJ was mounted up on this elaborate stage with dancers. It was not too packed and the crowd was very mixed with a huge diversity of age and nationality. So we danced and we drank and had a really good time. The music was the same as here and it was a nice night out. Overall I am very glad we decided to make the trip to Cape Town. Aside from the volunteering at the elephant park, it was one of the best experiences of my life-so far. I will admit there was quite a bit of hardship but I think that taught me a lot about myself as well as others. It showed me everything is not as expected and things are not always easy even if they should be. Although, nothing SHOULD really be anything as nothing in this life is a definite. It is all about exploring to learn and learning to grow and growing in pursuit of happiness. I arrived back at the park on Sunday evening from Cape Town to enjoy one last morning with the elephants on Monday. I woke up at 6:00 a.m. as usual and headed over to the Boma to await my last outing. I was surprised to find that as I sat there watching Harry’s herd feed, I felt ready to go home. I felt as if I had fulfilled my time at the park. We walked back up the mountain to the lodge where I waited for the next train out to the field to say my goodbye’s to Sally’s herd and I was able to say my final goodbye’s to Keisha. As the tractor approached I thanked Geoffrey for the wonderful experience. He looked at me and said “this is going to be a tough one to let go” and gave me a big grandfather hug. I said my goodbye’s to the guides surrounding me and a final goodbye to Sharon. As I said my final goodbye’s and made my way to the tractor, I felt a sudden, overwhelming lump in my throat. It finally occurred to me what I had accomplished. It finally occurred to me how big my leap of faith was. 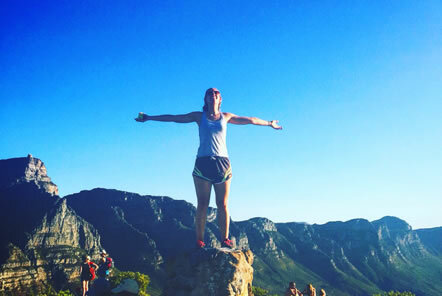 I went to freaking South Africa for crying out loud! I had the pleasure of hanging out with the world’s most magnificent and intelligent creatures every single day. I had the opportunity to walk a cheetah, to play among monkey’s, to explore a seven wonder, to engage myself in the South African culture of natives. I was able to do what most people dream of doing and never find the courage to do; for that I am proud, grateful, and hungry the next adventure."